This was a spring dinner, when local asparagus were in season, and I had just bought some fresh farm eggs. 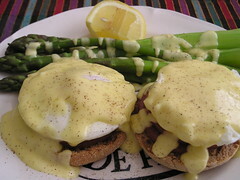 And the very good hollandaise sauce that Trader Joe’s had around holidays, magically reappeared in the store. For me that trio ade the perfect storm, so I had to indulge one evening. I’m sure the English Muffin must have been TJ’s whole wheat ones. And I likely used regular bacon (maybe that good Amish honey maple bacon), rather than bothering with Canadian bacon. Since I never seem to have a morning leisurely enough to make a real breakfast, having breakfast for dinner has become one of my favorite kinds of meals. Besides, if I had this for breakfast, I think I’d have to go right down for a nap after!